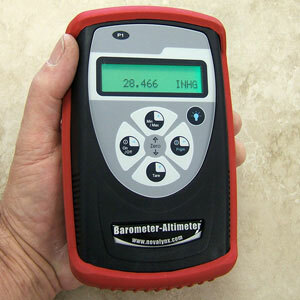 The 230-M202 Handheld Barometer Altimeter combines accurate pressure sensing with the power of microprocessor-based computations to provide instantaneous pressure and altitude readings. A combination of small size, digital display, versatility, and high accuracy make it ideal for field measurements or as a portable pressure reference. The 230-M202 Handheld Digital Barometer-Altimeter combines accurate pressure sensing with the power of microprocessor-based computations to provide instantaneous pressure and altitude readings. A combination of small size, digital display, versatility, and high accuracy make it ideal for field measurements or as a portable pressure reference. Keypad controls provide access to the operating functions. Pressure or altitude may be displayed in a variety of units. The LCD display shows the data output and operating mode. Data logging mode stores up to 240 readings for future recall. The unit is powered by four AA alkaline batteries (included) which provide approximately 100 hours of continuous use. The 230-M202 includes features for minimum and maximum (Min/Max) value capture, tare readings, and user selectable engineering units. A selectable altitude function allows users to enter site altitude above sea level in order to display local barometric pressure or barometric pressure corrected to sea level. User referenced altitude (referenced to map or trig markers) or altitude based on US Standard Atmosphere of 1962 can be selected for display. Using the altitude function with the Min/Max and Tare features makes the 230-M202 very useful for accurately measuring changes in altitude. This instrument measures atmospheric pressure very accurately, to within 0.015" Hg. The 316 stainless steel pressure sensor has extremely low sensitivity to shock, vibration, acceleration, and changes in orientation or temperature, yet features high sensitivity to pressure variations. The device is temperature compensated over its operating temperature range. 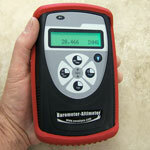 Each unit comes with a certificate of calibration traceable to NIST.